The swarm of earthquakes occurring near Tolaga Bay on the eastern coast of the North Island has continued overnight. Earthquake activity off the coast near Tolaga Bay has continued through the night. GeoNet reported another four earthquakes of magnitude four between 8 p.m. and 8 a.m. with another two smaller events to be documented. In all, six earthquakes with magnitudes between 3.9 and 4.5 have been reported by GeoNet over the past day. 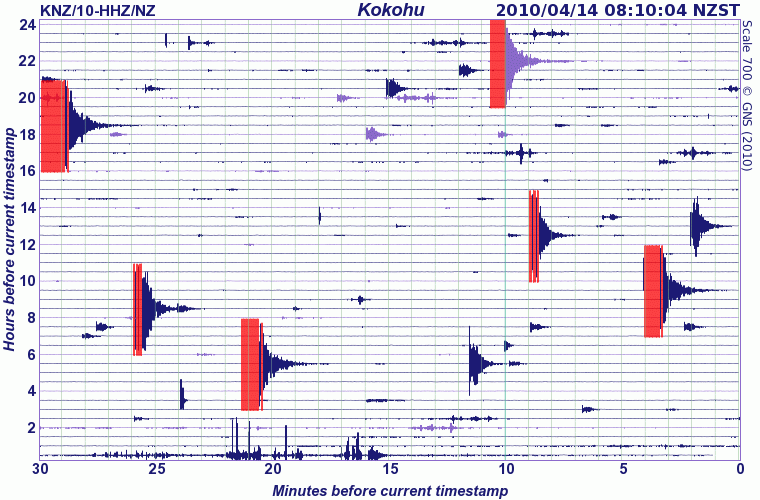 The seismograph at Kokohu Road, near Nuhaka in Hawke’s Bay shows the traces of the Tolaga Bay earthquakes recorded during the 24 hours to 8 o’clock this morning. The latest activity began with a magnitude 4.3 earthquake at 10:29 a.m. yesterday. A magnitude 4.5 quake then struck at 1:39 p.m.
Activity began again during the evening, with a magnitude 3.9 earthquake at 8:00 p.m. A magnitude 4.3 event followed at 11:05 p.m. and a magnitude 3.9 quake struck 38 minutes later. At 2:48 this morning, a magnitude 4.2 quake struck the area. All of the earthquakes were located 30 to 40 km south-east of Tolaga Bay at a depth of 33 km. This area was identified as experiencing a slow-slip earthquake between the middle of January and the middle of February. This entry was posted on Wednesday, April 14th, 2010 at 8:48 am and is filed under Earthquakes - Observations. You can follow any responses to this entry through the RSS 2.0 feed. You can skip to the end and leave a response. Pinging is currently not allowed.